April was Community Banking Month and banks everywhere highlighted what makes them stand out. In prior years, First National Bank participated in the 3/50 Project and all bank employees pledged to spend locally during the month of April. This year, the Bank decided to highlight one of the primary things that makes us a community bank: community involvement. Because all of our employees live within the Bank’s market area, they are all personally invested in seeing their towns and cities thrive. And as a result, they are all VERY willing to volunteer their time and energy to people and organizations that need help. We decided to keep track of their involvement to highlight what makes our Bank different. Here are the results of their voluntary efforts through the first quarter of 2013: 47 employees volunteered at 183 different events and collectively spent 625 hours investing in their communities. “Community” can be an over-used word these days, but the efforts of this group exemplify what community banking truly represents. Are Banks Lending Money to Small Business? There is a misconception that was especially popular during the banking crisis of the last several years and that continues today at some level. As a small business lender, I often get asked if banks are lending money to small business. The misconception being that banks–including community banks–are just sitting on their hands and are unwilling to invest any loan dollars into small business growth. The reality is very different, at least at the community bank level. The FDIC recently released a report that stated while community banks only have a small percentage–14%–of industry assets on their books, they account for 46% of all small loans originated to businesses and farms in the United States. I would argue this fantastic percentage of small business loans from community banks is the result of community banks being invested in their communities, leadership and decision makers who live and work in the areas they serve, and community bankers who are invested in seeing small businesses in their towns and cities succeed. First National Bank has seen great small business loan growth in the last 18 months, and I know other area community banks have made a similar commitment to finding and helping creditworthy small business owners grow and thrive. After today’s Bluffton Chamber breakfast, the Chamber and the Bluffton Center for Entrepreneurs hosted a small business workshop on the challenges of being an entrepreneur. About 25 entrepreneurs (and 17 Bluffton University business students) representing businesses from Bluffton, Findlay, Pandora, Columbus Grove, Ada, Beaverdam, and Lima swapped stories, offered advice, and shared words of wisdom about running a business from personal experience. There are certainly businesses that are cutting spending and taking a less optimistic approach to 2013. American Express announced yesterday they are going to eliminate about 5,400 jobs this year as part of a restructuring effort. Morgan Stanley is also eliminating 1,600 jobs according to reports earlier this week. However, the small businesses in the room today maintained that success doesn’t come from sitting still and it’s better to look past the negativity and find ways to adapt and grow. It takes partners who share this mindset for businesses to succeed. In places like Bluffton, Pandora, Findlay and other local communities, willing partners include community banks. A bank of any size sitting on excess funds can decide it’s time to put loans on the books and grow by buying business. However, when the economy falters and large national banks retreat, cut ties with small businesses they’ve suddenly lost the appetite for supporting, and then wait for better days, the value of invested community banks is significant. Chase and Jamie Dimon don’t need Bluffton or Findlay. Bank of America doesn’t need Pandora. But First National Bank needs Bluffton. First National Bank needs Pandora and Findlay. Ditto for Citizens National Bank and the communities it serves. Businesses and banks need each other to thrive–and healty communities need both–and the right mix is what allows small business to look forward and succeed in spite of challenges. In 2008, the Federal Deposit Insurance Corporation (FDIC) established the Transaction Account Guarantee (TAG) program to instill public confidence in the banking system. The program provided unlimited guarantees to non-interest bearing accounts through 2010 and then the program was extended to the end of this year (2012). And now in plain English (Sorry about that, too much banking jargon), banks pay into a federal program for insurance that guarantees depositors (anyone holding money in a bank) get their money bank if a bank fails and shuts down. Deposits have traditionally only been insured up to a certain dollar amount and anything over the cap is uninsured. In 2008, the TAG program raised the cap from $100,000 to $250,000 for deposit accounts and gave non-interest bearing accounts (like a traditional checking account) an unlimited guarantee. This was supposed to inspire confidence in a banking system that was floundering due to the financial crisis that was really picking up steam in Fall, 2008. Now, the Senate is supposed to vote today on whether or not to continue the program past December 31, 2012. The prevailing thinking is that this temporary guarantee helps community banks because they typically have less creative ways to structure accounts and keep dollars insured. The reality may be different. Earlier this summer, the Chairman of the FDIC, Martin Gruenberg, said most of the extra deposits protected by the temporary program were held in the Country’s 10 largest banks. That doesn’t mean community banks–and their customers–haven’t benefitted from the program, but they may not have been the “biggest” beneficiaries. Hopefully, small businesses, wherever they bank, have been able to benefit from the added security and will be able to move forward confidently no matter the outcome of today’s possible Senate vote. If you’re a small business or have personal deposits at a local bank, visit your banker or go to the FDIC website and find out if your deposits are protected. Chances are, your community banker will be able to make sure you’re covered one way or the other. From the authentic lemonade stand to the classic signage, this group of 5-13 year olds made the most of their afternoon. They poured lemonade, handed out stickers to loyal customers, and put their classroom learning to work. Thanks to all of you parents for allowing your children to participate. Thanks to all of you who bought cold lemonade on a chilly day in order to encourage these eager kids to take the initiative and get excited about working hard and earning money. Thanks to Bluffton Presbyterian Church for allowing the kids to set up shop on the church lawn. Thanks to Bluffton Dari Freeze for donating cups for the stand. 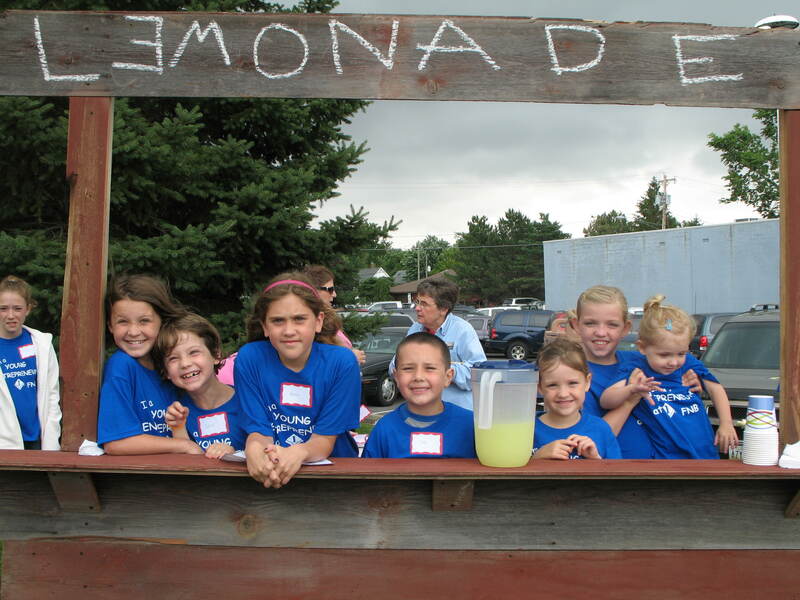 Thanks to Randy Scoles and company for his great work on the lemonade stand. And thanks to the young people who participated and have a little extra money in their savings accounts as a result of their labor. New Business Coming To Bluffton! A new business will be opening its doors on June 24, 2011, in Bluffton, Ohio. And, earlier this spring I had the opportunity to facilitate a strategic planning session for this aspiring business. The company has about 40 employees that are full of energy, passion and enthusiasm. They come from different backgrounds but they all have bright minds and you can see the potential when they start moving in the same direction towards a common goal. Direct Competition: There will be plenty of it; will be tough to compete long-term; especially Common Grounds, Community Markets, The Food Store, etc. Marketing: Social media and local media(I offered to help with this one), door-to-door selling (see note above on being persuasive and cute), pass out coupons on Main Street, make lots of noise at the business location, have customers wear stickers publicizing that they participated. Hours of Operation: Friday, June 24, 2011, 1-5pm; see how it goes and play it by ear to determine if we reopen after Friday. Back to Kasasa…Where does this fit into reality? 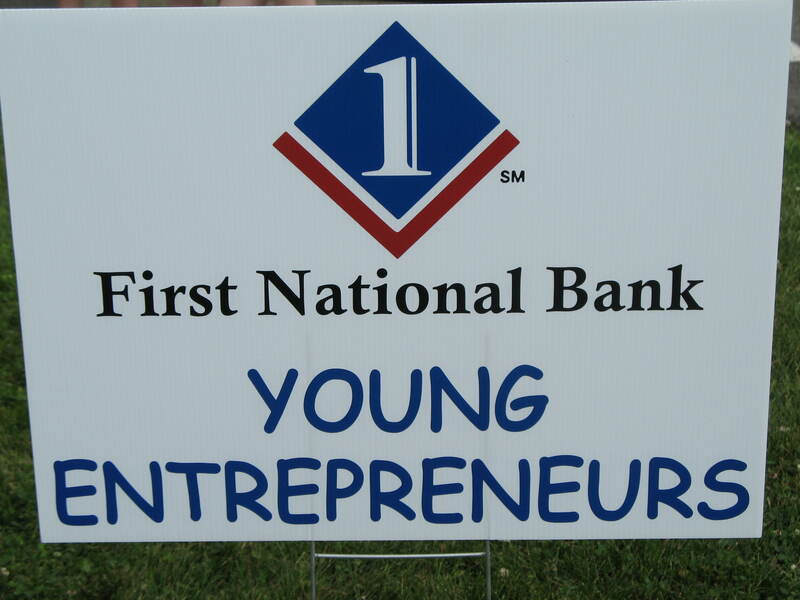 Since we launched Kasasa at First National Bank on May 9, 2011, we’ve had a great response from the community. Many of our existing clients are giving it a try and finding out this product is fantastic. We’re also seeing a good number of new faces coming through the doors at all of our branches to see what the buzz is all about. Kasasa (i.e. rewards deposit accounts) does seem to fly in the face of everything a bank normally holds dear: we pay a modest rate of interest, don’t get too crazy with promotions and gimmicks, and don’t do anything that will make people wonder whether or not we really know how to take care of their money. In contrast, Kasasa pays a rate of interest most people would jump to have right now on a certificate of deposit, and we’re willing to pay it on a checking account. Kasasa is a word that sounds crazy and maybe a little gimmicky. And with the rates and the name, people may be wondering if we really know what we’re doing at First National. The reality of the situation is that banking is changing. We are a small business, and we have to adapt to challenges just like any organization; lately it seems like we see a new challenge every time we turn around. For example, we are VERY heavily regulated, and the rules aren’t going to be loosening any time soon. Competition is also fierce as non-banks are starting to offer products we’ve offered for years. And, technology is changing the way everyone conducts business—including banking. We have more accounts and customers than we’ve ever had before at First National, but we have fewer and fewer people coming into our branches on a regular basis. As online banking, direct deposit, and smartphones become more and more prevalent, we are realizing we have to adapt in order to be successful and provide a relevant service you value. 1) Debit cards – We earn money—interchange—whenever someone swipes a debit or check card. In addition, it costs us more money to process a paper check than it does to handle electronic transactions. If a client swipes her card a certain number of times (10) in a qualification cycle, then she meets this criterion. 2) estatements – It costs us money every time we generate and mail paper statements. It costs a LOT of money over time. Some estimates are that it costs more than $2/Statement mailed. In order to qualify for the account rewards, a client has to agree to receive statements electronically. The great thing is that this not only cuts costs, but also provides a couple significant benefits to our clients. First, estatements are environmentally friendly because they can be viewed online without having to be printed. Second, instead of having to wait on your statement in the mail, our estatements are accessible immediately after being generated through our online banking. In addition, the online banking site provides instant access to old statements so in essence you have an archive of statements at your fingertips. 3) The final qualification is to have one direct deposit or one automatic ACH (electronic) debit in a qualification period. One of our main goals in offering these new accounts is to develop clients who use us as their primary bank. We’d love to be the primary bank for all of our clients. Clients who have direct deposit or set up automatic ACH debits are more likely to use the account as their primary account. We’re trying to encourage that relationship. Ultimately, in order for us to be a successful bank we need to adapt. Adapting in this case means embracing technology (debit cards/estatements/electronic transactions), cutting costs (estatements/debit cards), and growing relationships with clients so they use us as their primary bank (Direct deposit/ACH debits). This is a mutually beneficial development because we’re accomplishing our goals by offering superior products and meeting the financial needs of our local communities. Hopefully, this helps a few of our Kasasa skeptics understand both the benefits and the reasoning behind the products we’ve introduced. It is possible for both sides to benefit in a situation like this. I’d welcome your comments and feedback on any of this, and if you have questions about Kasasa and rewards accounts, feel free to respond.